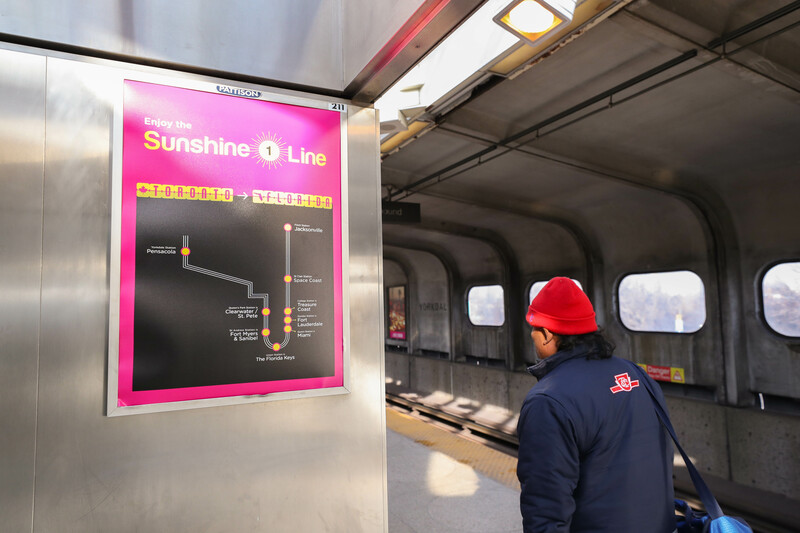 As it turns out, Toronto’s TTC 1 Subway Line happens to be shaped exactly like the state of Florida. 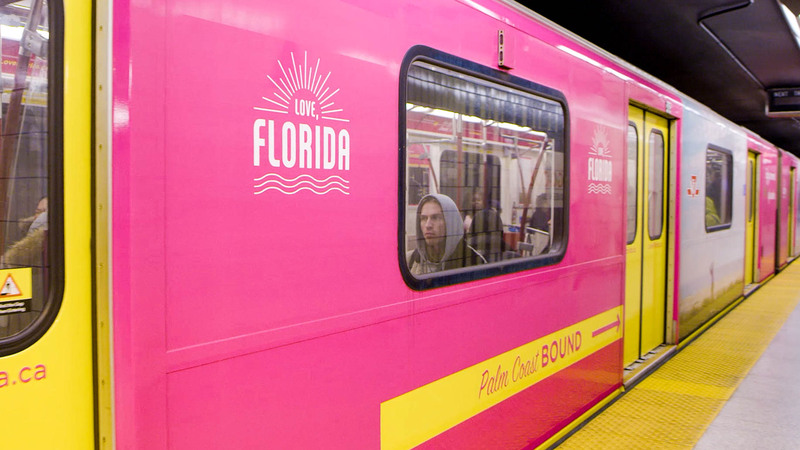 And with another cold Canadian winter looming, we partnered with VISIT FLORIDA to create the Sunshine Line, transforming the subway into the Sunshine State—destinations included. 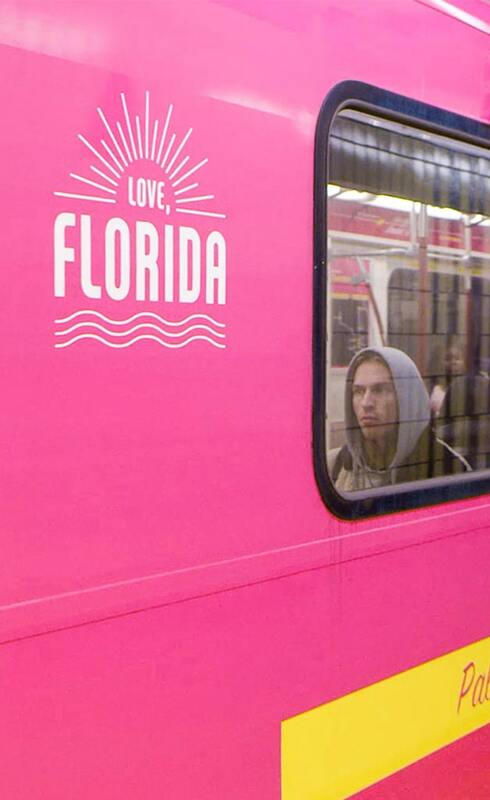 Throughout the campaign, passengers on the bright pink train were taken on a true-to-life tour of Florida during their morning commute, where nine individual stations were reimagined as their corresponding Florida cities. Yorkdale station at the line’s northwest corner became Florida’s northwestern city of Pensacola. Union Station at the southern tip of the line became the state’s southernmost point, the Florida Keys. 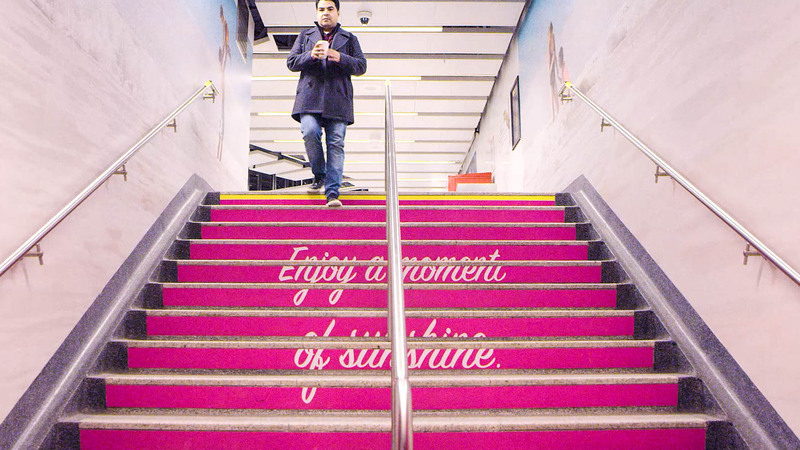 More than 300 different placements transformed station platforms into immersive experiences, from signage featuring signature Florida views, to staircases that descended from the street into beaches leading to the ocean, and platform pillars that revealed beach vistas when viewed at the right angle. 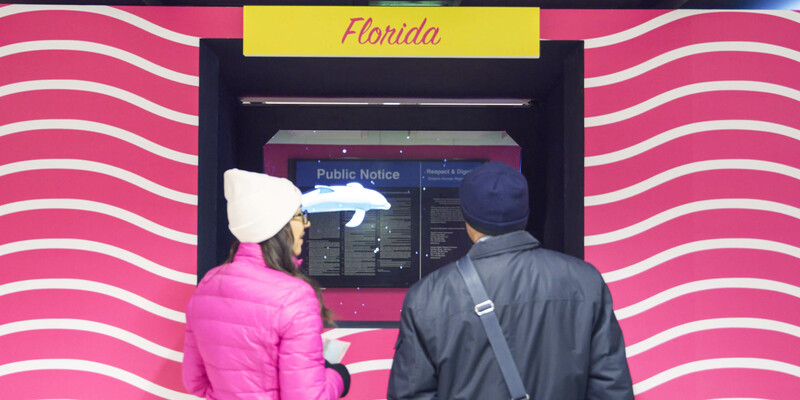 Booths in Union Station also featured Florida-inspired holograms. Flamingos walked along the beach while manatees, dolphins and sea turtles swam through the ocean. 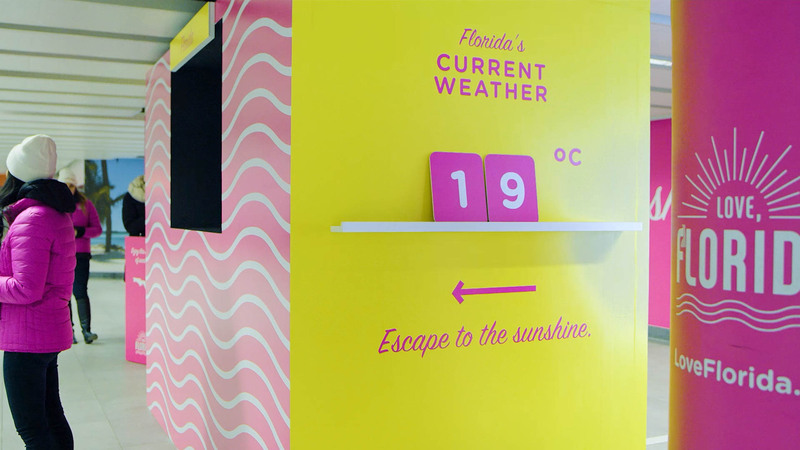 Vacationers could also be seen hitting the golf course, shelling for shark teeth and playing beach volleyball, bringing a vision of much warmer weather to life right before commuters’ eyes at a time when the average high was about 31°. 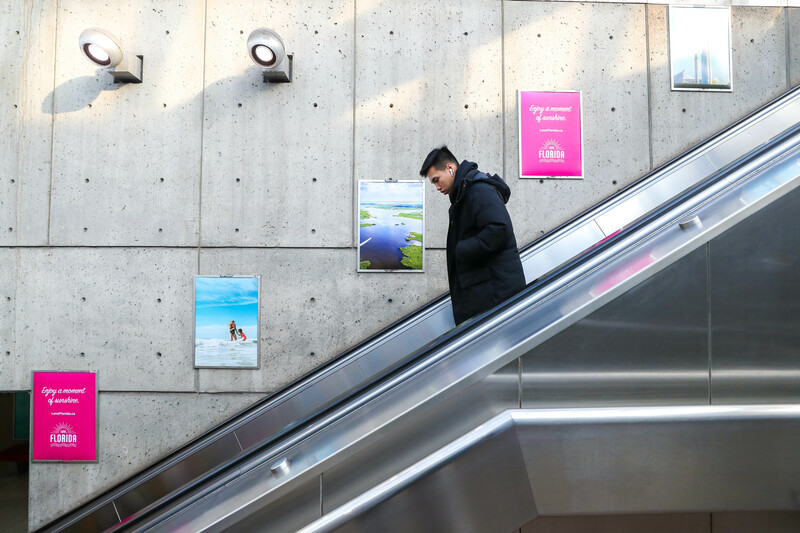 All in all, the month-long tourism campaign brought moments of sunshine to nearly 16 million Toronto commuters—an average of over 700,000 riders per week day. Keep an eye out for the full campaign coming soon. See more of our work for VISIT FLORIDA and other destinations here. The move comes as part of an effort to better serve a west coast clientele that includes Petsmart Charities, Petsmart Inc. and Marriott.